We offer a variety of specialty products from industry-leading manufacturers. 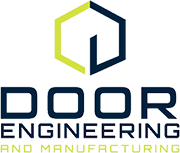 Door Engineering and Manufacturing has been providing customized industrial, commercial, aviation and specialty door solutions for 50 years. Door Engineering allows architects immense design flexibility by offering both customized and pre-engineered door system options, along with a variety of aesthetically pleasing fabrication and finishing alternatives. Door Engineering's door systems are not only built for long-lasting durability, but also for low maintenance, speed and safety. The advanced design and construction of the four-fold door enables it to function under high cycle and other severe conditions. Top hung sliding door systems offer multiple configurations including bi-parting, teleslide (multi-panel) and single slide. Vertical lift doors are designed for heavy-duty applications that have limited side room. McKeon Door is a trusted manufacturer of overhead and side activated coiling grilles, doors, fire door systems and custom engineered closures. With more than 50 unique products, they have a door or grille to accommodate virtually any opening. Side acting fire door systems available in both manual or motor operated designs and with or without egress doors. Automatic closing horizontal shutters prevent the migration of heat, smoke or hot/toxic gases by creating vertical compartments thereby separating the vertical spaces from one another.